Retired Gen. Carter F. Ham, AUSA president and CEO, and retired Sgt. Maj. of the Army Ken Preston, AUSA vice president for NCO and Soldier Programs, recently visited AUSA’s Sunshine Chapter in Orlando, Fla.
Ham was the guest speaker at the chapter’s general membership meeting, where he and Preston were welcomed by the chapter president, retired 1st Sgt. Daila Espeut-Jones. Retired Gen. Carter F. Ham, center, AUSA president and CEO, and retired Sgt. 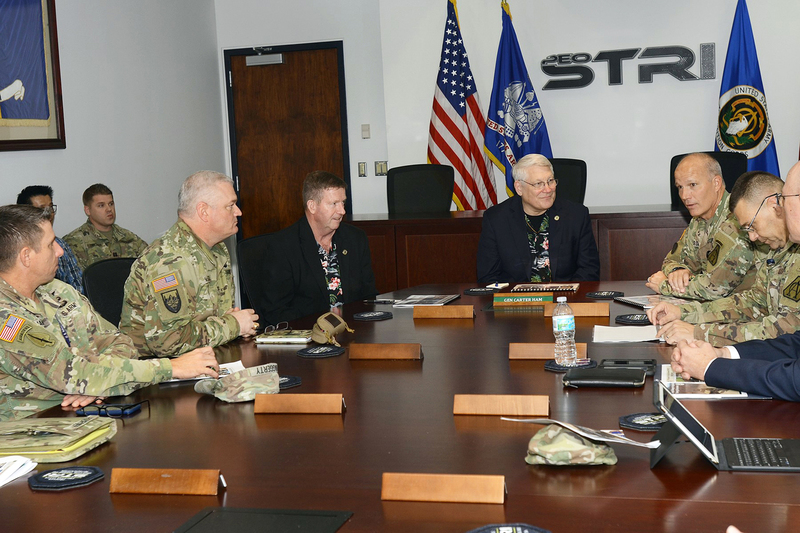 Maj. of the Army Ken Preston, AUSA vice president for NCO and Solder Programs, left, meet with soldiers during a visit to AUSA’s Sunshine Chapter. After the meeting, the group visited the Army’s Program Executive Office for Simulation, Training and Instrumentation (PEO STRI), where they received an overview from Brig. Gen. Michael Sloane. PEO STRI executes a multi-billion dollar program annually and is staffed by more than 1,000 military, civilian and service support contractors. Ham, Preston and the chapter leadership also met with Lt. Col. David Jones, the University of Central Florida’s professor of military science, and many of the university’s Reserve Officer Training Corps cadets.